"Being able to reunite these cats with their families is very rewarding." Shaun is a certified Arborist and a professional mountain guide, and has loved animals since as long as he can remember. He was five years old when he adopted his first kitten. Currently, he has two feral rescue cats, Medi and Gari, that he has cared for since they were young and has two dogs that are his best friends. Shaun created Canopy Cat Rescue in 2009 where they rescue cats stuck in trees, any time day or night. Shaun loves climbing trees and helping reunite owners with their feline friends. Q: How did you get into animal rescue? 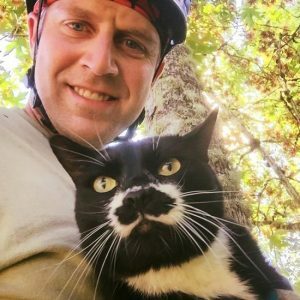 Q: Are there any Canopy Cat Rescue stories that stand out? Q: Why do cats climb trees if they usually cannot get down? Q: What does it take to learn how to climb trees and rescue cats? Q: What keeps you motivated to keep doing what you’re doing for animal rescue?